With so much bad news around us, it may seem difficult to find true acts of charity in this world. But from time to time there are events that make us recover our faith in humanity. He was a different little boy who preferred to give up his games and, even his rest time, giving it away to make a difference. He did it with pleasure, he wanted nothing in return from the animal. And, did with a lot of patience before going to school. A Reddit user, under the name of Bluecollarclassicist, shared this incredible story with the world. 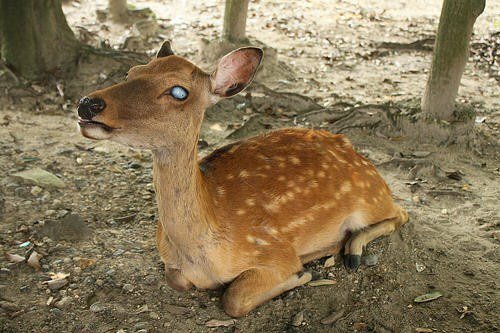 Recently a blind deer has lived in a neighborhood of the American state of Illinois, where the reddit user lives. In nature, an animal like this could not survive but due to the efforts of this kid, the deer has now a chance of survival. What the kid does has moved our hearts and filled them with tenderness. Blind deer do not live for long, they usually starve or end up being run over by vehicles. Roads are extremely dangerous places for these animals, especially if they are blind. However, this was not the case for this deer, who luckily visited this neighborhood by chance, where every day a boy helps him find a place to rest and eat, guiding him carefully, from one sidewalk to another. Fortunately, the news about this wonderful story flew and reached the ears of a local rescue organization, who is now taking care of taking the deer to a place where they can live safely and happily. The job the little 10 year old did with the deer is to be admired. He never tried to adopt the wild animal as a pet. He did not even name him. The Kid searched for the deer quietly every day. And he also helped him walk safely and looking for food. The wildlife rehabilitation group took the deer in a horse trailer, it is the only legally empowered entity to treat and shelter this wild animal in the state. At the time of the rescue, half of the neighborhood left to see what was happening, including the boy and his mother. Fortunately, the deer is safe and can have a peaceful life with other animals. The child is the sweetest example of someone helpful and understanding among all the people in the neighborhood. The Reddit user and his wife hope to reward the child’s act of kindness and take him to visit the deer in the state wildlife preserve.